I'm from Maine and I'm allergic to lobster, so it was somewhat ironic when my sister and I boarded a working lobster boat off the shores of Portland, ME. Here, seven things I learned from a day pulling traps in Casco Bay. I'm from Maine and I'm allergic to lobster. The irony of this is not lost on me. I grew up in a tiny lobstering village on the coast, but, save for one near-miss when my grandmother absent-mindedly tried to feed me a claw, I've never tasted it. So it was somewhat paradoxical when my sister (who is also allergic to shellfish) and I boarded the Lucky Catch, a working lobster boat off the shores of Portland, Maine. Growing up, I watched my family and friends crack open tails and scarf down lobster rolls. I saw lobstermen haul their catch onto the pier and refereed many kitchen-floor crustacean races. But, because of my body's aversion to shellfish, I couldn't actually tell you much about lobsters. So, when I recently got the opportunity to don some highly fashionable orange overalls and spend an afternoon on a lobster boat, I knew it was my chance to really get to know my home state's most prized delicacy. Here, seven things I learned while lobstering. 1. 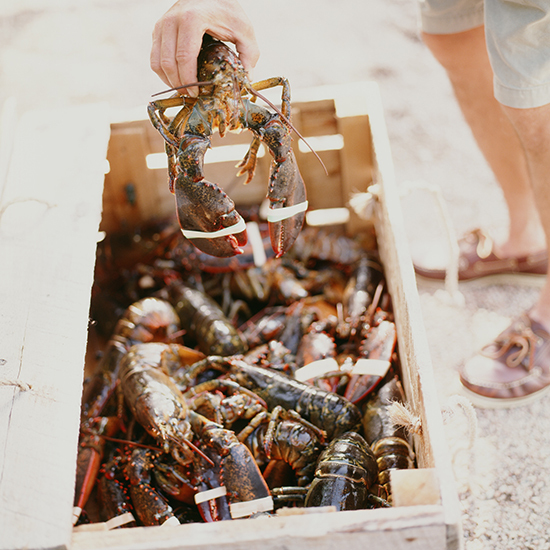 Lobsters love smelly fish. For bait, our captain, Tom, stuffed four dead herring into a small net bag and cinched it closed. Lobsters love these oily, smelly fish, which are caught in the billions with a massive underwater net. 2. Measuring lobsters is serious business. Lobstermen pull up their traps and measure whatever lobsters are inside using a brass-colored lobster gauge. "Keepers" must measure three and one quarter inches from their eyes (literally: the hook of the gauge is snagged into the eye socket) to the edge of the solid carapace, before the segmented tail. Tom told us to measure from both eye sockets: Lobsters can be lopsided and (according to him, at least) only one side needs to measure up. 3. Today's throwback lobsters are next year's dinner. Since lobsters only grow when they molt, the lobsters that were slightly short this summer will be ready for next summer's lobster bakes. 4. There are giant lobsters out there... mating. Breeding females (or "berried hens") must be tossed back, too: According to law, lobsermen must cut a V-shaped notch in the tail of any female dotted with eggs, so that subsequent lobstermen know to throw her back for life. But this rule means that breeding females will continue to grow enormously large, so Maine also has a maximum-size law: Males over five inches must also be thrown back, to preserve giant mates for these giant females. 5. Lobsters regenerate. Like humans, lobsters can be right-clawed or left-clawed, with one dominant "crusher" claw and one smaller "ripper" claw. And if a claw gets injured or partially torn off in a fight, the lobster can shed it and grow a brand-new one in its place, no harm done. 6. Lobsters are cannibals. The real reason you see lobsters with banded claws in tanks? It's less so they won't pinch humans and more to prevent lobster-on-lobster murders. The crustaceans will pick fights with one another and, when food is scarce, they're also known to eat their fellow lobsters. 7. Lobsters might be immortal. As we puttered back into port, the boat's first mate casually told me that lobsters might live forever. It's still under investigation, she said, but I nearly fell off the boat. Biologists believe that lobsters' telomeres, the tips at the end of DNA strands that hold them together, don't degrade like humans' do, allowing their DNA to remain intact indefinitely. Essentially, that means lobsters never age and can continue to grow and grow. The largest lobster ever caught weighed 44 pounds, and others are known to be over 100 years old. Unless they die in a fight, are eaten by another lobster, get too big and starve or end up as the daily special at a lobster shack, lobsters just don't seem to grow old and die. While I learned a lot on my day of lobstering, there was one impression that didn't change after my time pulling traps: Lobsters might hold the key to immortality, but they could still kill me.